Children between the ages of 5 and 8 need to learn how to count, add and subtract numbers. Learning how to add and subtract is actually part of the elementary school curriculum. There are many fun addition and subtraction games and toys that help children practice counting, adding and subtracting numbers such as money toys, flash cards games, board games and more. Money toys are great addition and subtractions games because children enjoy playing with fake money and because these toys encourage them to count change, and to add and subtract numbers as they make the change. Children practice counting, adding and subtracting numbers without realizing it and all while having tons of fun. 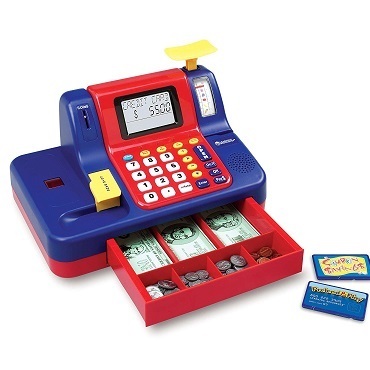 Toys such as the Cash Register Toy are very popular among children because they love to play store and with fake dollar bills and coins. What we like about this toy is how realistic the cash register is and the LCD screen and voice that challenge children with new games. Instead of a toy cash register, you can also get a toy abacus. Ιn ancient times, the abacus was actually the equivalent of the electronic cash register today. With the abacus, children learn to count and they can even learn to add and subtract large numbers when they learn to use the abacus. There are a number of fun addition and subtraction games that can be played with these cards such as Addition War, Problem Solving Stories and Multiple Choice and the rules of the games are provided with the cards. In Addition War, the person who answers the question properly gets the card and at the end of the game the person with the most cards wins. The flash cards contain also multiplication and division questions for older children. There are board games that involve playing with fake money such as the Buy It Right Shopping Game and Monopoly (you should get the Junior edition). By counting the money and making change, kids practice counting, addition and subtraction. Sum Swamp (ages 4 and up) is another fun board game that teaches children subtraction and addition and the difference between odd and even numbers. The game is about trying to escape the mire by rolling a dice. Depending on the number they get and on which square they land, players move their way forward or backward by either adding or subtracting numbers. There are also shortcuts provided (such as "The Crocodile Shortcut") and traps (such as "the Endless Loop") which add excitement to the game. Sum Swamp is a great board game for children struggling with numbers. Actually teachers have also been using this game in the classroom in order to teach their students addition and subtraction without getting them bored! There are math activities that you can organize at home that are fun and that can teach children addition and subtraction. Smart-kid-educational-games.com has a list of math activities that you can see at: fun math activities. For addition and subtraction practice, we recommend Math Race. You can download and print the game for free by clicking here! Make sure you also print out our free addition and subtraction tables here. They are good to use if your child plays any of these games.